Unexpected Homeschool: It's Finally Fall! It was back to school and schedules this week after the relaxing break. Amber had a great attitude Sunday evening about starting her lessons again and she's been pretty positive all week. What a difference a little rest from school can make. We decided to go ahead with the alternate school schedule his week even though Amber desperately wanted to try the old schedule one more time. She has been having more intestinal trouble and we did have to do an intestine cleanse last Saturday just as break ended. Waking up at the time appointed by the original schedule did not seem likely. After all the pondering over early mornings we had 4 required early mornings this week due to various appointments. It was ridiculous. Thankfully, I checked the calendar before scheduling our assignments for the week and was able to work around the busy mornings. We skipped Latin entirely this week and alternated writing and grammar each day. Amber has started feeling a little better this week yet still not completely well. After the cleanse on Saturday did not give the desired results, we spoke with the GI doctor on Monday. Amber has now been put on probiotics for a few weeks in addition to her other medications. We also have removed dairy from her diet as a trial, again. I've completely messed up a few times with her dairy free diet. It seems so much harder than gluten free to me. At any rate Amber is feeling somewhat better, but since I've not been especially good at keeping her dairy free I'm not sure that dairy was the issue. Still we continue on the extra special diet to the best of my forgetful ability. (TOP) Playing yard darts with Mom and Dad. These might be safer, but I miss the metal tipped darts of death we grew up using. (BOTTOM) Amber getting a little more use out of the swing set. Hopefully, it is going to her cousins soon. That will be a sad day. 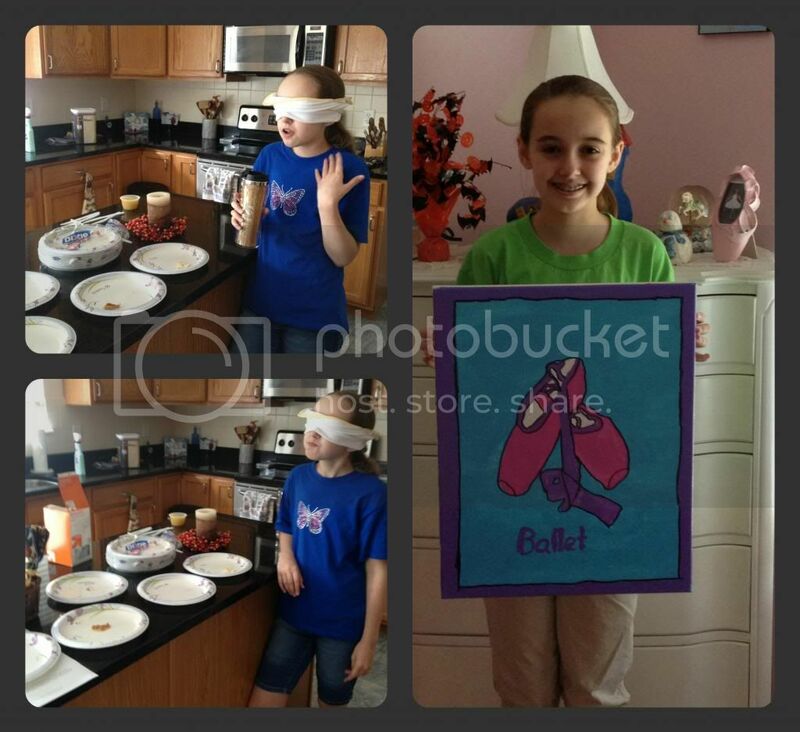 Then Amber tried all five spreads again with only the blindfold while chewing with her mouth closed this time. She successfully identified all the spreads the second time when her nose was free. Just for the record the spreads were: almond butter, peanut butter, peanut butter with honey, Nutella, and margarine (see... at least I thought about not using actual butter). Canvas painting and painting the pottery projects from last week were scheduled for art class this week. Amber spent an extra hour at her class and only finished the canvas painting, but that was just fine with the instructor. I'm so thrilled with this class, it is worth every last penny. Again, I didn't take pictures during class, but in my defense last week and this week I was working on projects of my own. I've found it to be unexpectedly relaxing to work on art projects while Amber is in class a few tables away. It's getting a little pricey with her class and my projects, but at least I'm not out shopping. (TOP-L) Amber explaining the breathing and chewing problem while still blindfolded. (BOTTOM-L) Trying to decide the taste (without her nose pinched shut). Honey Peanutbutter vs Peanutbutter was a challenge. (RIGHT) Amber canvas painting from art class. Flute continues to sail along and be just as enjoyable as the first week. Amber has moved into two new music books after only a month of lessons. She sounds great for such a short time playing. Eventually, Amber's prior musical experience will cease to be such an advantage and she will slow down in her progress. In her free time Amber has been devouring the David Eddings books. Fred decided Amber was finally old enough for them and last week started her on the Belgariad series. This week she is already on the Mallorean series. Thankfully, we have all of Eddings' books and don't have to make library runs for the next books. Amber gets so terribly excited over the details in these books and wants to have discussions with me. While I am thrilled to be the person she has chosen, it has been years since I read those books and the details are quite fuzzy. I do remember being equally enthralled by them, so at least I can understand Amber's exuberance. A frequent sighting: Amber reading a David Eddings book. We decorated the house for Fall on Monday this week, as prescribed by Amber. 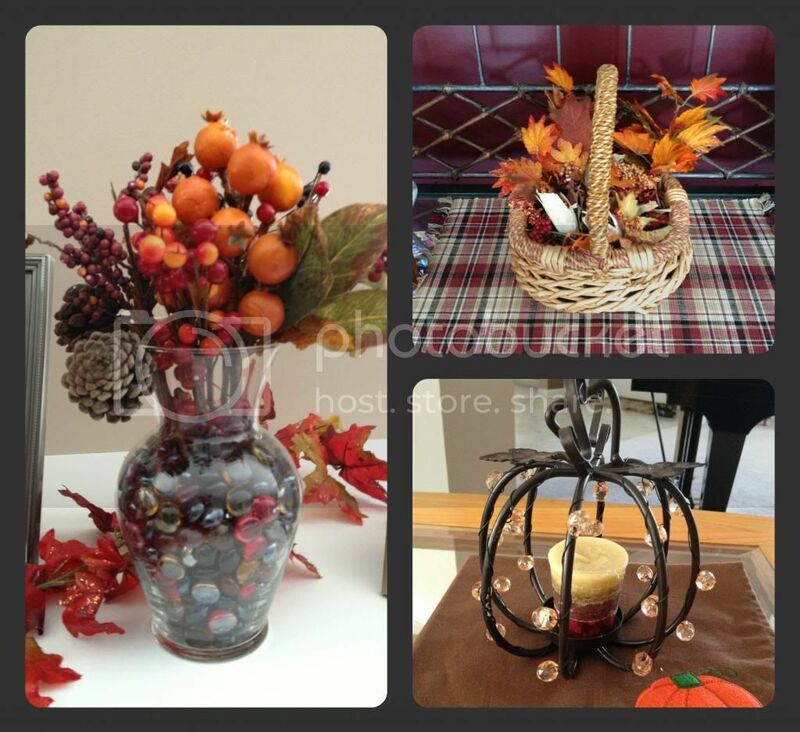 It seems that last year I decorated for Fall during the late morning and early afternoon of the first Monday of the new season, with the windows open and I had Amber studying at the kitchen table while I worked. I also dictated her spelling pretest during this time. I have almost no memory of this. Amber has a very detailed memory of the day, because in her words, "It was a happy day for me." In these situations, when she is so happy Amber will decide something has become a tradition without informing the rest of us. So, Sunday evening I was informed of the exact procedures for Monday. It was a bit of a shock as that did not play into my plans for the day, at all. The decorations are different this year because we have very curious kittens including one who is nicknamed "Troublemaker" and "Destructo". Yet we managed to decorate the house on Monday in a way that hopefully made Amber happy, or at least reminded her of the happy day last year. Today, Amber is studying / reading / goofing off with her daddy at work. This was sort of a last minute idea we had and both of them were excited for the day. Tuesday, I received a call from my mom with the heartbreaking news that my 46 year old cousin had passed away that morning. It was a shock, to say the least. He was part of the local cousin group that I grew up with (my dad had 12 siblings, so my cousins are quite numerous) and my cousin was even the officiant at my wedding after being ordained just a couple months prior. Today is the funeral and originally Amber was going to go with me. I tried to explain to Amber which cousin this was, even showing her a picture, but she professes to have no memory of him. In actuality, she had met him and spent time with him on many occasions last year, most being when my father was ill and at my dad's funeral. Apparently, my cousin is part of the memories that Amber still suppresses. Even after therapy last year some issues remain for Amber that we are working through. Fred and I decided that Amber would not attend the funeral after all, as it seems somewhat counterproductive to our efforts. Instead, she gets a fun day at work with Daddy. What a lucky girl. Amber approved Fall decorations. Very few are kitten proof. Hmm... We bought candy corn at the store the other day and as it is my biggest weakness, ever, you can image how this went. Processed food: Still down and not gone. It's going to be hard to give it all up, especially with the whole candy corn in every aisle of every store until Thanksgiving. Strength training: 30 minutes, not including Friday. Piano Practice: Umm.. Zero. Sooo... Sunday my right hand hurt like I had bent the four fingers (not the thumb) backwards too far while sleeping or something. It wasn't bad, just weird. Monday my knuckles on that hand were swollen and I couldn't bend my hand at the knuckles or grip anything. It aches a lot and while not as bad as Monday (I think.. or I could just be used to it), the first two knuckles are still swollen and I can't grip very much. Therefore, no piano this week. Medical: Success! One day I just up and decided this was happening, so I made an appointment with a new primary doctor. I called the office for the endocrinologist, but got dumped to a voice mail. That did not bode well for the future, so I'm reconsidering that particular doctor. I also went to my eye doctor: I'm down to 20/30 vision, but still only need glasses when fatigued or driving in the dark. LOL. The opthamologist dilated my eyes too and there are also still no signs of diabetes in my eyes at all. Yippie. Relaxed in the evenings for an hour at least with Amber AND Fred. I slowly worked on the huge white sections of my Winter Queen... I loathe Rainbow Gallery Wisper White at this point. During our relaxing times we did actually finish Merlin last Friday evening. Poor Amber was beside herself with the ending. The silly child had no problem with Robin Hood's ending, but was nearly in tears that Merlin didn't finish like it does in all the books she has read. Saturday, Fred was able to convince Amber to finish watching the Stargate movie and she actually admitted to liking it. It was a difficult admission for her given all the anti-Stargate statements she has uttered. Then Fred managed the impossible and convinced Amber to give Stargate Atlantis a try. Sigh... he wasn't a big SG1 fan, so he just skipped right over to Atlantis. After a crash course on the whole Atlantis backstory and five days of watching Atlantis, Amber is hooked. There was even some cajoling on Wednesday to get me to watch an episode before dinner. It didn't work, but I'm glad she likes it so much. The funniest part of it all was when Amber heard the main theme music. Her eyes widened and she points to my phone, "That's your ringtone for people you don't know." LOL. After all these years she finally figured out that my main ringtone is the Stargate Atlantis theme. Crazy child. This weekend, if the rain holds off, is outside house maintenance and general resting. I enjoy reading about your weeks. Good job on the health updates. It takes work to take care of yourself when there are others who need you. The fall decorations are lovely. What an amazing week you had!!! I love the art projects and you are right the classes can be spendy but so is shopping :) I think GF and DF are both difficult but doing them together makes it a lot harder. I was DF for 9 months while BFing my little one before she outgrew the sensitivity. Best of luck with the dietary changes! 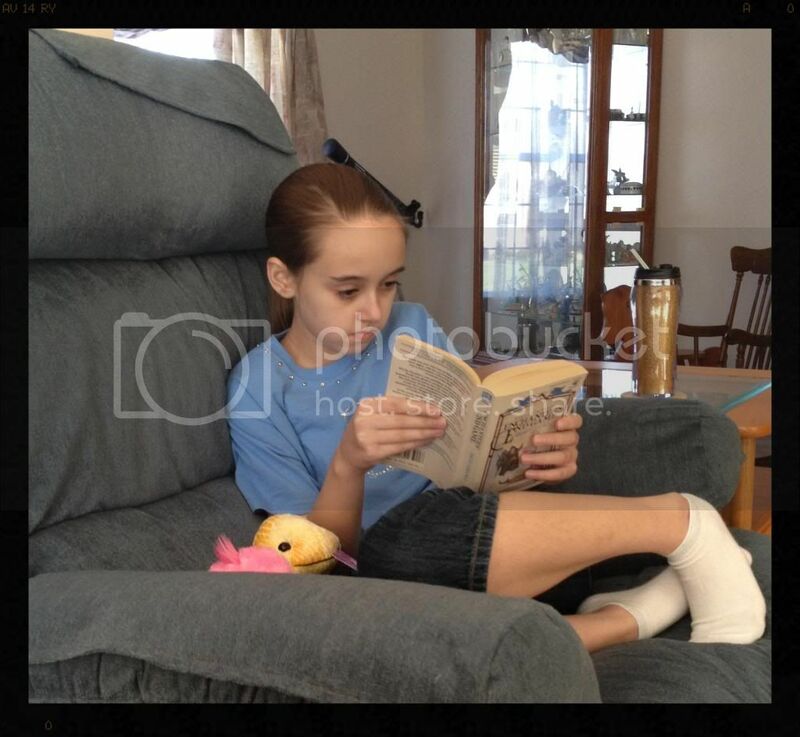 When I first saw the photo of Amber reading I went 'That book is on my wife's shelf' I called her in and she went 'Yep, that's Enchanter's Endgame' She recognized it without me making it bigger. Sorry to hear about your cousin. Our prayers are with you. I know how tough it can be for kids to deal with death. I am glad that Amber has decided she likes Stargate but I agree that starting with Atlantis misses a lot of the story. Your wife has good taste in books :) I'm just waiting for the SG1 crossover episodes with Atllantis. Those are going to take a bit to explain. She takes Florastor (one of the probiotics that I take). It's in a capsule form. She could have taken Align instead, but Florastor is what I had on hand (I take Align too, but was out of it.. LOL). Awesome week! Your Fall decorations are gorgeous and I love your back yard! I have never heard of the books Amber is reading - off to check them out. Wow! You guys accomplished so much! I can't even buy Nutella anymore because I've been known to eat the whole giant jar practically all by myself! It is so good! I think Jeremiah would like this experiment though! I've never even heard of David Edding. I'll have to look him up! I'm sorry to hear of your cousin's passing. It's so hard to lose the people in our lives. I smiled all the way through this post Christy. What a great week. So sorry to be late reading but I was sick all weekend. Feeling better now. I hope Amber is doing better. Love the taste test! 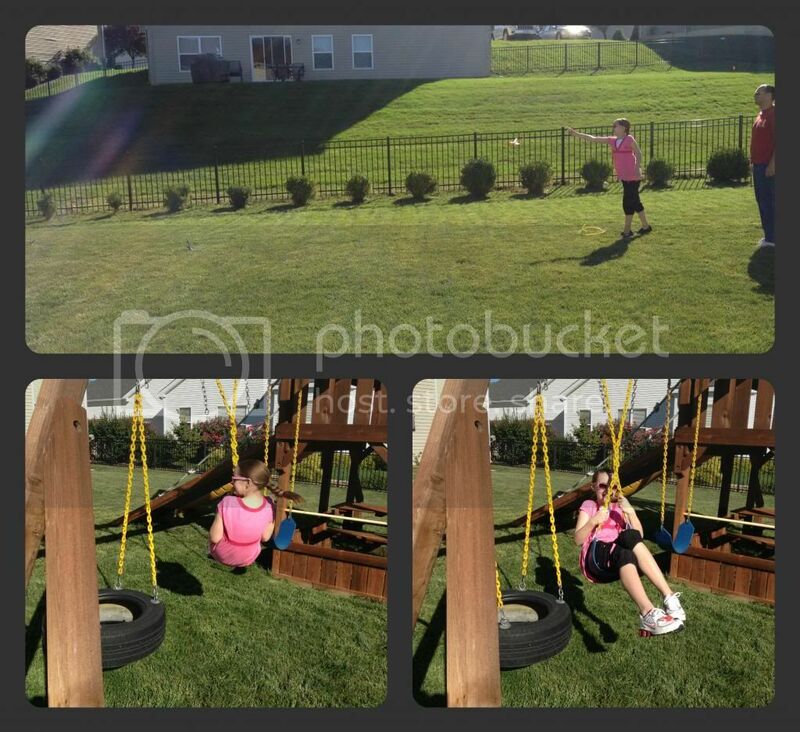 Keilee did one for her 7 Cool Homeschoolers and it was fun! Love Amber's Ballet Shoes! Great job. And the decorations are wonderful. We were going to put ours up today, Oct 1, but we had a few new windows installed and I didn't want to have to compete with the noise. Off to check off David Edding. I am familiar with the name but not the books. Happy October 1st!! !